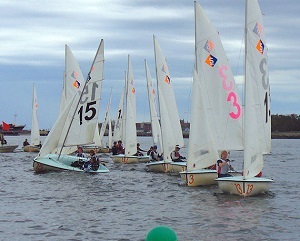 As if there weren’t enough complications in sailboat racing already, most sailing venues in the Northeast also feature current on the racecourse. What do you need to know about sailing in current? First, some basic terminology: Tide refers to the vertical change in water along the coast, as in high and low tide on a beach; current refers to the horizontal movement of water (that creates high and low tides). A spring tide is a tide during a full or new moon. When high tides are higher than usual, low tides are lower than usual, and the current will be stronger than usual. What does this mean for you on the racecourse? It means that you’ll want to do some homework before you even leave the dock to determine what to expect. Some of this information can come from a calendar and tide chart, but if you’re sailing in an unfamiliar venue, it’s also a good idea to ask about local current patterns. Next, some basic information: In the approximate six hour period between high and low tides, current will be weakest around high or low tide and will run the strongest during the middle two hours of the cycle. Current is stronger in deeper water and when it changes direction, it switches first in shallower water. What does this mean? It means that you will see changes in the current throughout the day and that you may have different strengths of current or even directions on different parts of the racecourse. Fortunately, you can check the current on the course by looking at the water as it moves past anything that’s anchored. If a lobster pot or other small buoy appears to be moving because it’s giving off a small wake, the “wake” is showing you the direction that the current is going. The size of this wake can clue you into the current’s strength. (Sometimes it can also be helpful to look below the surface for seaweed that’s caught on the anchor line.) If an anchored boat is pointing in a direction that is not directly into the wind, this is also a clue that there is noticeable current. To get more a more exact sense of current, you can drop a sponge or other item that will float low in the water and see where it floats in a given period of time. By replicating this experiment at different locations or between races, you can get a sense of what the current is doing across the course or throughout the day. Once you know what the current is doing, you should consider it as you formulate your strategy. If the current is more favorable on one side of the course, aim to get to that side. If it’s running from left to right or right to left, you’ll generally want to sail into the current first. This way, the current will keep you relatively centered on the course and you won’t find yourself quickly in a corner having to sail up current to get to the mark. Current can be very important on the starting line. If the current is running with the wind, the fleet may sag beneath the line, but if it’s running upwind, you can expect boats to be pushed over the line early. If the current is running right to left, it may open up a hole at the committee boat that a late comer can capitalize on and the boats at the pin may get jammed up while trying to pinch up around the pin. Finally, if the current is running left to right, expect to see boats piled up (and barging) at the committee boat and expect to find it easier to get off the line at the pin. As you approach the windward mark, remember that current will affect laylines. Current going with the wind or right to left will move the starboard layline upwind. Conversely, current running upwind or left to right will effectively move the layline downwind. It’s always fun to pass your competitors as they reach into the mark having sailed extra distance, or thrown in extra tacks as they struggled to pinch up to the mark. Don’t forget current when you’ve rounded the windward mark! Once you get yourself settled on the next leg, get a range off of the next mark – look to see if there’s a point on land that lines up with the mark. Similar to a linesight on the starting line, if you keep these two points aligned on the run, you’ll be sailing a straight line to the mark. Bear in mind that due to current pushing you, you may have to point your bow above or below the mark to stay on this line. However, your competitors who keep their bows pointed at the mark will actually sail a banana-shaped course to the mark without realizing it.